Sam Rayburn, Toledo Bend and Lake Fork, along with other Texas lakes, are dotted with lots of bass tournament through the year; there is something going on just about every week. Maybe some of them have pre-fished the lake trying to find out what and where the bite is like. What’s the water temperature hovering at, is the water clear or off-colored? Each angler has a special lure that he or she has put their trust in. The lure to use depends a lot on the time of the year the tournament takes place, but some baits are perennial favorites no matter when the tournament occurs. When reporting tournament results I always look for the lures used, when, how, and where. Bear in mine the anglers are not going to give you precise locations, but it should be somewhere close. The following are some comments shared by anglers around Texas in poll taken as to what their favorite three lures would be. Jaret in Nacogdoches uses crankbaits, Carolina Rigged worms and chatterbaits. James from the Dallas/Ft. Worth area refines the crankbait selections down to a square bill, and includes the Texas Rig along with the Carolina Rigged worm. John ties on either a jerkbait of some sort, and he further refines the crankbait choice to one that runs around 6-8 feet deep, and one more vote for the Carolina rigged worm. From the Dallas area comes a vote for a Drop Shot set up, weightless Flukes, and the Carolina Rig. A spinnerbait makes its first appearance as a choice and a Brush Hog. A weightless Fluke gets its second vote. Jigs, Beetle Spin, and a Lunkerhunt Dragonfly, two baits you don’t hear much of receive votes. Another two votes for the spinnerbaits, and one for a buzzbait. One angler shares the use of a Frog for top water, slops pads, docks and rocks. If he or she is fishing docks, they will be skipping a Senko worm. A Carolina Rig worm is for deep ledges, hoping to add the kicker bass to win the tournament. For me it has always been a Carolina Rigged worm that will work in just about any fishing situation. 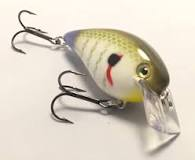 For early in the morning, a floating/diving crankbait such as the Bomber Long A fished around grass and weedy shorelines. Cast and let it sit until you can’t stand it anymore. Twitch it so it dives and hold on. My third choice would be a crankbait especially if you are fishing underwater structure. Crank it down till bumps off the structure, pause, and then resume the retrieve. The bass always hit on resuming the retrieve. 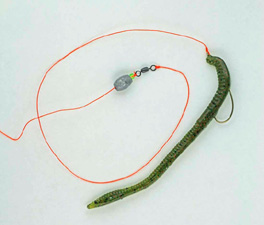 I would say that the Carrolina Rigged worm is the number one choice to include in your fishing arsenal. Choosing weights, worm choices and colors, and length of leader is a whole new topic for another article. I agree with the statement – “Fish you strengths.” That usually adds fish in the livewell or on the stringer.